Should you ever take rank away from students? 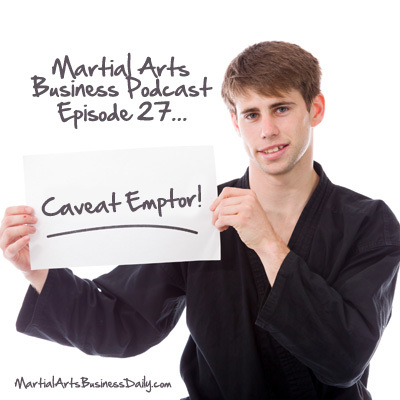 All this and more in this week’s episode of The Martial Arts Business Podcast! This Week’s Main Topic: Buyer Beware! How can you tell someone who knows what they’re talking about, from someone who doesn’t? The fact is, many times you can’t… which is why you need to check out the people you’re taking martial arts business advice from. As you’ll hear about in this podcast episode, there are always people who are willing to give others advice that they are unqualified to give. Moreover, many times those people have the gall to charge others for the privilege of sharing their theories. And that, my friends, can get you into serious hot water. So, listen in to this week’s podcast episode and find out how you’re getting fleeced – and more importantly, find out what you can do about it so you don’t get burned and so it doesn’t happen again. And, in this week’s Tip of the Week, find out where your business needs to be seen online in social media, and why. I think people in the BJJ arena and the martial arts in general need to chill out. Instructors – you have a tendency to try to control your students too much, and it’s really creepy, how much instructors think they can control their students, and how much they think they should control their students. I’m telling you right now, people are forgetting that you’re in the beginning stages of building an industry, or rather building a niche within the martial arts industry, whose primary purpose is serving a clientele. These people, these students, are your clients – they are not your children… they can do whatever the heck they damn well please.